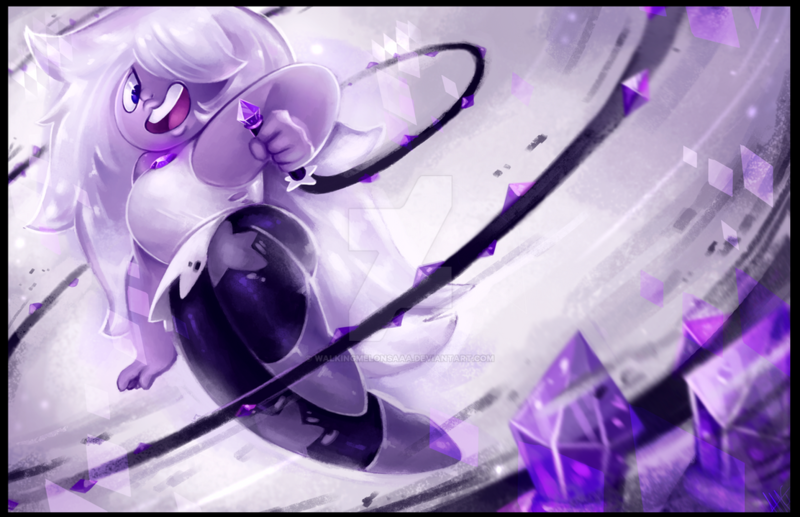 Awesome Illustration on Amethyst here! Keep up the Progress! Hello! I don't mean to bother, but I find this piece of art very creative and think it would be perfect to repost on a Facebook page I help run. It is called the 'Crystal Gems' and we are non-profit. We just like to repost peoples art (with credit of course) so they can spread their art to a wider audience. But, if you do not want this piece reposted, that's fine! Just let me know and it will not be posted. If you do want your art posted, feel free to reply to this comment with any other links. Though, the links you provide have to be related to the art in some way (i.e: not just a regular blog on Tumblr., but one dedicated to your art). Links that we accept are deviantart, tumblr, Facebook pages, redbubble, and instagram. If your link has a lot of NSFW art, please let me know so I can mark it as such! Nice one. This is a must fave for any SU or Amethyst fan. oo may i really love your art style! She loks so amazing and fun! I love how shiny your art is, it's so eye catching! Hope to see more SU speedpaints from you. .
She looks so cute and happier! I wanted to use it as a wallpaper but it has the stupid water mark, so I can forget that. Love it, its like a character poster for a film. does anyone know what art program they us? Your art is amazing and I love this show!! GGGHhhhhhHUUUUUUU OH MY GOD SHE'S SO CUTE!!!! Okay, it does look cooler that way. 'Sides, her whip is an extension of her body. If Garnet can make gauntlets the size of skippy balls, she can make long whips.